I wrote this as an afterword to the short story “The woman who measured the heavens with a span” by Sara Maitland. This was originally published by Comma Press in Litmus: Short Stories from Modern Science. It has now been included in Moss Witch, an anthology of short stories by Sara Maitland. It is reproduced here by permission of Comma Press. Henrietta Leavitt’s original paper (pdf file freely available) on the Period-Luminosity Relation was published on March 3rd 1912 in a Circular of the Harvard College Observatory. It was “prepared by Miss Leavitt” and undersigned by Edward C. Pickering, the Observatory Director. Years of careful measurement of photographic images of the sky led Henrietta Leavitt to a discovery that is fundamental to how astronomers measure the scale of the Universe. Distances in space are so vast that we don’t write them down in kilometres, there’d be too many zeros. We use units called parsecs or sometimes light years. Light travels at 300,000 kilometres per second. At this speed, it takes eight minutes to reach us from the Sun (a distance of about 150 million km or 93 million miles). This same light, passing by the Earth, would take a further 4.2 years to reach the nearest other star, 40,000,000,000,000 km away. We call this distance 4.2 light years. Our galaxy, the Milky Way, contains several hundred billion stars and is about 100,000 light years across. Light from the most distant galaxies we can see has taken billions of years to reach us. Since we can’t just take out an extremely long tape measure we have had to adopt some ingenious ways of measuring distances in space. The most accurate and direct way is called parallax. It relies on measuring the apparent change in position of a star as seen from different points on the Earth’s orbit around the Sun. The closer the star the more its position appears to move relative to stars in the background. However, the change in position is tiny. So, although fundamental, its use is limited to relatively nearby regions of space. It is used however as the first rung on a “distance ladder”, calibrating other techniques that work at greater distances. One of the most common methods of estimating much greater distances in the Universe is the use of “standard candles”. Imagine two identical candles which shine with equal brightness. If one is placed farther from an observer than the other, then it would appear fainter. In fact the brightness follows an inverse square law, so for example if it appeared 100 times fainter this means it is 10 times farther away (10 squared = 100). In practise, of course, the candles are replaced by stars or other objects which are thought to be the same intrinsic brightness. The technique then allows their relative distances to be estimated. If the distance to the nearer one is known by some other method, say parallax, then the actual distance to the farther one can be calculated. 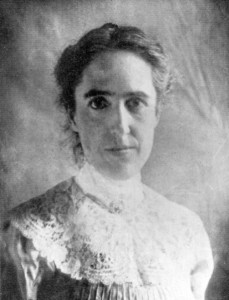 At the time that Henrietta Leavitt was working at the Harvard Observatory, we did not know the scale of the Universe. Indeed in 1920 there was a Great Debate on the subject between astronomers Harlow Shapley (who later replaced Pickering as Director of Harvard Observatory as described in Sara’s story) and Heber Curtis. Curtis argued that the “spiral nebulae”, the most famous of which was the Great Nebula in Andromeda, were galaxies in their own right, lying outside our own Milky Way galaxy. Shapley however thought that the Milky Way was itself huge and that the Universe was essentially one large galaxy. Objects like the Andromeda Nebula were simply clouds of gas inside the Milky Way. Leavitt’s work proved crucial to resolving this debate. Leavitt worked as a “computer” at the Observatory. Before iPads and PC’s, a computer was a human being who carried out calculations by hand or with the aid of mechanical devices. Commonly the computers were educated women who found it one of the few ways into a scientific career. Observatories and other organisations would often employ teams of computers at rather low salaries. Problems would be organized so that they could be fed into the “computer” room, worked on by a team of people and the answer fed out at the other end. Beginning with astronomical calculations of the orbit of Halley’s comet in the 1700’s this practice continued through to applications such as atomic weapons development during World War II. Leavitt’s work focused on the detailed analysis of photographs of the sky taken with Harvard’s 24-inch Bruce Telescope in Arequipa, Peru. Large glass plates covered in photographic emulsion were used to record the images. These were then returned to Harvard. Her job was to take each plate, mount it on a device which illuminated it from behind and, with the aid of a magnifying eyepiece, carefully measure the sizes of the black dots representing each star on the negative image. The larger the dot, the brighter the star. Each plate would contain many thousands of stars. This was a painstaking task, requiring patience, attention to detail, accuracy and stamina. Sara’s story makes clear how the Observatory Director Edward Pickering instructed her to work on the North Polar Sequence and other important tasks in calibrating the brightness of stars. However, her major contribution and lasting legacy was her work on the Cepheid variable stars in the Small Magellanic Cloud. Many stars change in brightness. Some because of flares or explosions, others because of eclipses by an orbiting companion star. The Cepheid variables repeatedly brighten and then fade with periods ranging from a few days to a few months. They are named after the prototypical example, delta Cephei. Although the cause was not clear when Leavitt was studying them, we now know that this variability is because the stars pulsate. The combination of changing size and temperature causes the variation in brightness. The Large and Small Magellanic Clouds were of particular interest. Looking like small clouds in the night sky, they are actually two dwarf galaxies close to our Milky Way. Most easily viewed from the southern hemisphere, they are named after Magellan, the famous explorer who sailed the southern oceans. Plates of the Small Magellanic Cloud were sent from Peru back to Harvard for analysis. Leavitt carefully measured the brightnesses of stars on repeated photographs over months and years. Since the stars in the “Cloud” were grouped together, they were all approximately the same distance from us, and so there was no confusion caused by one star appearing fainter because it was much farther away. Like others of her colleagues, Leavitt was not simply a human calculator – she improved her measurement techniques, thought carefully about the data she collected and what it meant. In particular, she noticed that the brightest Cepheids rose and fell in brightness more slowly than the fainter ones. This has become known as the Period-Luminosity relation. Pickering published Leavitt’s statement of her results on 25 of these stars in a Harvard Circular of 1912. By simply measuring the period with which the brightness of a Cepheid rises and falls, the relation can be used to determine its luminosity, the intrinsic brightness of the star. A comparison with its apparent brightness then allows the use of the “standard candle” technique to determine its distance. Leavitt’s discovery has proved crucial to measurements of distances in astronomy. In the mid-1920’s Edwin Hubble found Cepheid Variable stars in the Andromeda Nebula and was able to use Leavitt’s relation (as calibrated by Shapley) to measure the distance to the Nebula. This showed that it lay at much greater distances than previously thought, outside our Milky Way. It was therefore a galaxy in its own right, contrary to Shapley’s earlier views in the Great Debate on the Scale of the Universe. Working with Milton Humason, Hubble went on to use Cepheids and other indicators to gauge distances to other galaxies. They found that the distant galaxies were all moving away from us, the most distant moving the fastest. This is now a cornerstone of our understanding of the expanding Universe and its origin in the Big Bang. Even today, Cepheid variables remain a major rung on the cosmic distance ladder. However, developments in technology mean that modern equivalents of Leavitt’s painstaking measurements have been massively expanded. For example, OGLE (the Optical Gravitational Lensing Experiment) uses a robotic telescope in Chile to study the Magellanic Clouds and the centre of our Milky Way. Each clear night, about 100 images are automatically taken with CCDs (similar to those in domestic digital cameras, albeit of better quality). These are processed through pipeline software (the modern equivalent of the old “human computer” room) resulting in huge databases of the changes in brightnesses of hundreds of millions of stars. The OGLE survey is used to study stellar variability including Cepheids but also caused by the warping of space-time as predicted by Einstein. Similar automated surveys are used to find planets orbiting other stars or study the explosions of stars which map the expansion of the Universe. Modern astronomy and our understanding of the Universe owes a great debt to Henrietta Leavitt and her dedication to the measurement of variable stars in the Magellanic Clouds.